Loners are cats who do not cause trouble for the clans, as they live outside the clans' territory. Loners can be cats who have been exiled, or have run away from their clan or two-legs. Some have lived as loners for their whole life, but live outside the clans' territories. They usually live in barns and catch the mice there. Coal is a friendly, gray loner with green eyes that lives on the farm on the edge of MoonClan's territory. He helps the Forgotten Clans all the time, whether they're traveling to the Sunrock and need a place to rest, or if they need fresh herbs, (there's a garden beside the barn), or even if Clan leaders need some advice in making a decision. Coal has fought in many epic Forgotten Clan battles, but has never sided with one Clan in particular. He fights on whatever side he believes should win, or whatever side has less warriors, to make a fair fight. Coal has been asked many times by the Clan cats to join their Clans, but he has friends in each of the Clans, and could never choose one Clan over another. Coal is very content living by himself in the twoleg barn, and helping the Clans in whatever way he can. .
Bee is a very imaginative she-cat. She is a brown tabby she-cat with brown eyes. Bee lives in an abandoned barn near Fourstones. She can turn a tale of a warrior hunting a mouse into a gigantic story! She is friends with all the clans. Bee has been offered many times to join a Clan, but each time the answer is "nope i like my life on the farm." Though, she will visit one of the Clans, and maybe tell a tale to there kits!! She and Coal have had some augments of the barn she lives in, so Bee found a barn for him to stop all the fighting. That valiant, and brave Bee!!! Bug is half rogue and half loner. She is a light brown she-cat with dark brown paws, face, and tail. She is a very fierce cat, although her tongue is sharper than her claws! She has been offered to join Scar, but her answer is always NO! 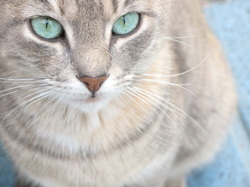 She is a grey tabby with blue eyes. She is very adventures and scared of twolegs because when she was a kit she was beaten with a stick by one and she was put in a freezer where her left front paw got frost-bite. Now it goes numb at the oddest times. She was once trained by the cats of Darkness but left when she was told of there past. She loves to run and climb trees. She some times talk in riddles to confuse her friends and foes. She have a big crush on Blaze. He has always been a loner and never wanted to be in a clan. Hr is kind, generous, brave, and not afraid to speak up for himself or for friends. Annabelle is a calico she-cat with purple eyes. She used to be a kittypet until her owners died in a fire. Her sisters name is Hazeleye and she has a crush on Blaze. He is a small tom and he hates Scar. He has a long tail and uses it to trip other cats while fighting. He is brave, loyal ,and always going on adventures and if you're wondering he was never in a clan he has always been a loner. Lollypop is a orange she cat with blue eyes and a white tail. Lollypop is very cheerful and hyper and bouncy and jumpy gets excited way to easy. She used to be kittypet ran away because the new dog chased her out. She has crush on Littlefoot. Sugar is a white She-cat with grey tips on her ears and tail. Her blue eyes are welcoming and kind. Candy is a cream she-cat with a bit of brown on her tail and ears. Her green eyes are deep and dark scareing cats. She is kind and mean but mostly mean at other cats not her family. Cookie is a Brown tom with black stripes going everywhere. He has brown mystic eyes and a liking for Candy. He is kind on his good side this cat may look weak but he can fight a small dog in no time! It is Umbreon. I know. Dawn is a pretty Black with gold band she-cat with deep green eyes.She is a good hunter and fighter although when she was a kit she had NO SKILLS AT ALL because her mother wouldnt allow her to learn any from her father. Reason? Unknown.She loves to help out the clans in any way she can.She does not show weakness EVER. She feels very fond of Mango and is quite bossy.She often sticks her nose where its not supposed to go.She used to train under the dark forest but stopped when she got a life threatening injury.Her mother is Panda, a black and white Slender she-cat who has green eyes.She died when an unknown cat killed her.She just met her father again and hates him even though deep down she knows she still loves him.She has a little crush on Littlefoot.She is very wise though sometimes she can just be plain dumb.She wants to find out who killed her mother and kill whoever did.She can get sick easily and recently learned how to swim. 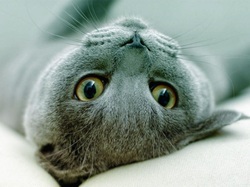 Lilaceyes is a pretty silver tabby with periwinkle eyes. She is blind but has amazing hearing and scenting.She is kind like Jayfeather.She is only 8 moons.She is friends with mango and is much like her.She is great at herbs and is like a medicine cat.She is connected with starclan even though she is a loner. Riley is a blue tom with blue eyes. He is very mysterious and can keep his calm almost all the time. He has a strange past that he rarely takes about. Riley came from a forest far away from here, one day he fell on to DarkClan territory. Four black cats where there and attacked him. He has a strange this where he can scenes peoples auras. Meaning he can feel peoples feelings and thoughts. He does not have a mate, never has. He has never had kits. He kinda likes Lilaceyes. Spottedsight is a calico tom with grey eyes. He is also blind like Lilaceyes. He is very Calm, and smart. He really likes to freak people out by making them think that he can see. Espona is a hazel and silver tabby,with brilliant green eyes. She is a charming cat,but is very shy and only likes to be around her friends. She is brave and would risk her life for others if she had to. She was once in a clan but was beat up and exiled when she was framed for a murder.she can see and hear very far away things. Before she was exiled from her clan the medicine cat said she was one of the crystal twins,but she does not know the other twin.Her best friend is Marin and Wednesday. Flandre is a blueish-gray she cat with blue eyes. She is VERY shy and is rarely seen. She has a Alter-ego. 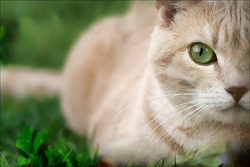 When she is in that state she has been known to "accidently" kill countless cats.Many cats hate,and want to hurt her. She never talks to anyone and will run away if you approach her.She will never ask for help even if she needs it.And dont try to corner her.EVER.You might not be seen again. She has no friends yet. 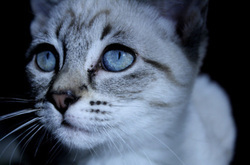 _ Crystal is a blue-ish silvery she cat with ice blue eyes. She is very young and shy,but is not afraid to fight. She is very naive because of her young age. She is only 3 moons,she was seperated from her parents at a young age when she and her family was attacked by the dogs,she was the only survivor. her eyes turn the coor of her emotions,when she is happy they'll be normal icy blue,but when shes mad they'll be red. _ Moon is a black she cat with green eyes and is(somewhat)related to dawn.She is very agile and can jump and run faster than any loner. She is a bit feisty and often has a bad temper. She is 5 moons old and isnt very happy about it. She likes to snap at people and respond coldly. _ Sonic is a blueish cat with green eyes. He loves to run. He is VERY FAST! Even faster than Moon; more agile too and a fast thinker. He is quiet around strangers. He can be very annoyed at times but he is mostly kind, generous, cleaver and loves to explore. He is 16 moons old. _ Peachy is a cream tabby with green eyes and a kind spirit.She has had a rough past and tries not to tell anyone about it. She cant keep secrets very well and sometimes admits defeat easily. But she also knows alot of things that could help the clans AND the dark forest,but she rarely talks about it. Her mother and father are unknown.She is 5 moons old.She likes to go out on adventures and is very playful.